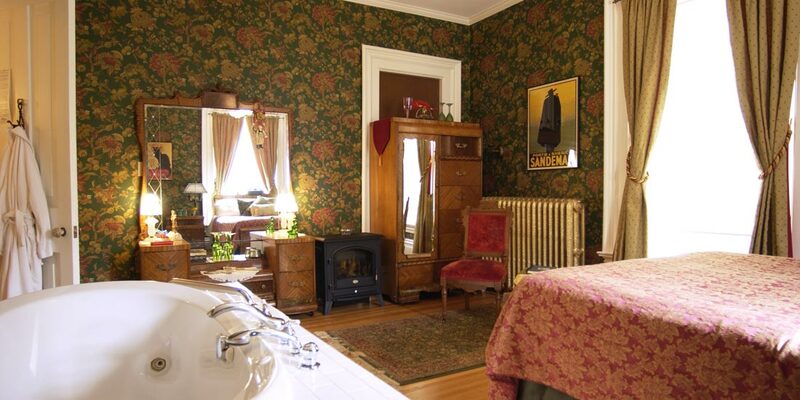 Our Red Wing MN accommodations feature spacious guestrooms, each with a two-person whirlpool and hand held shower, electric fireplace, central AC and beautiful antique furniture. Complimentary wine and appetizers are served Friday and Saturday nights, and a gourmet breakfast will greet you Saturday and Sunday morning. During the week we serve a sumptuous breakfast and afternoon fresh-baked cookies. A continental breakfast of fresh fruit, juice, homemade baked goods, and coffee/tea is available every day if you would rather dine in your room. 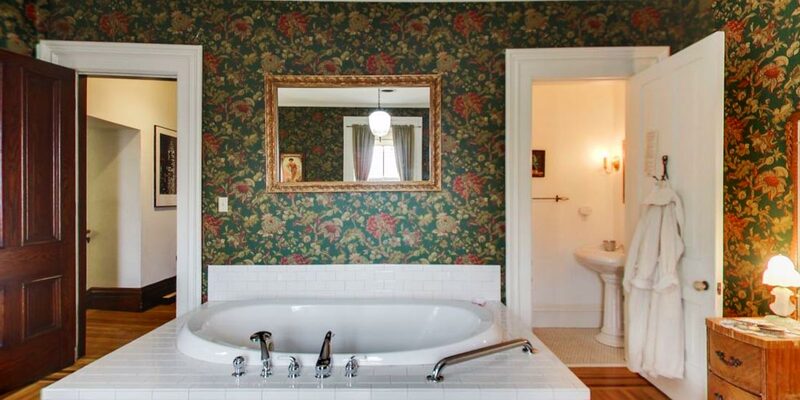 Put your feet up and take in this magnificent chamber. 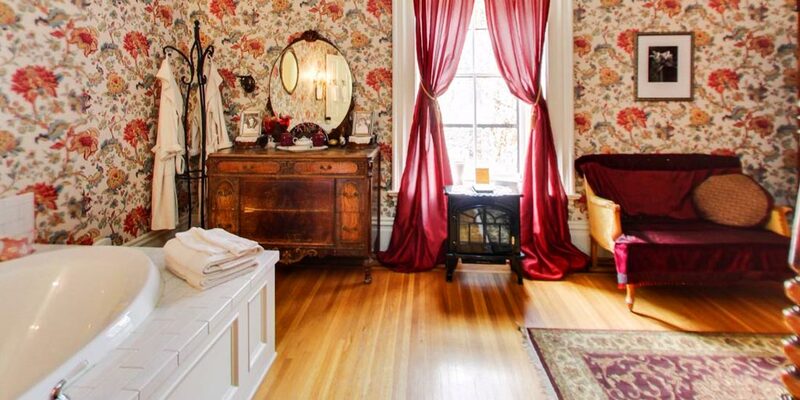 Rich silks and satins and a fantastic wall covering incorporating reds, whites, and greens will please the eye. 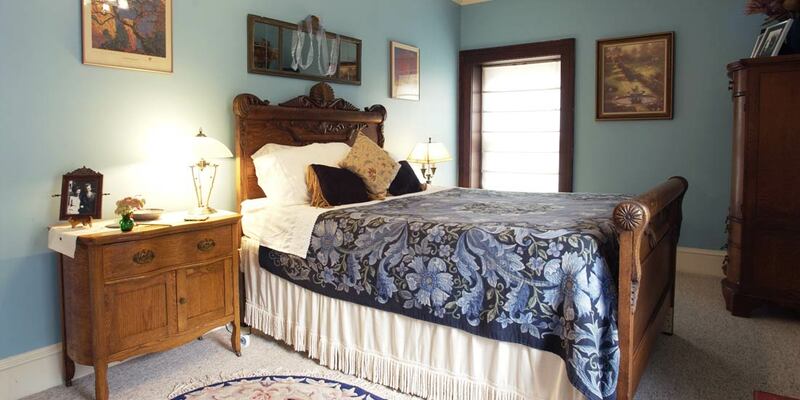 The elegant European bedroom set, built in 1905, features a comfortable queen size bed. There is a nice view of one of the bed and breakfast's gardens. 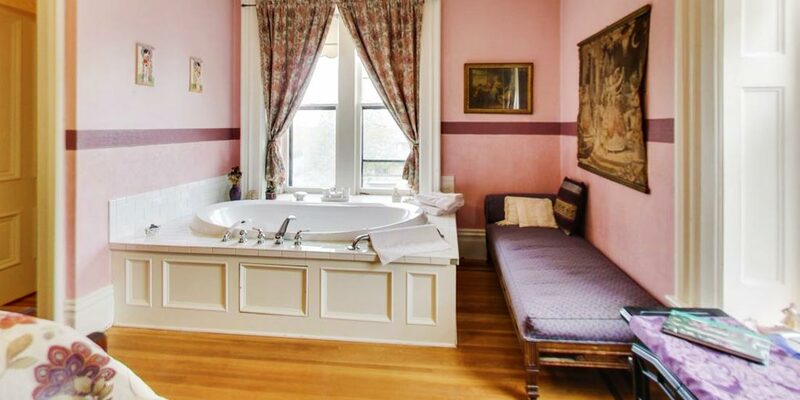 Soak in a luxurious bath and watch the stars come out at night. 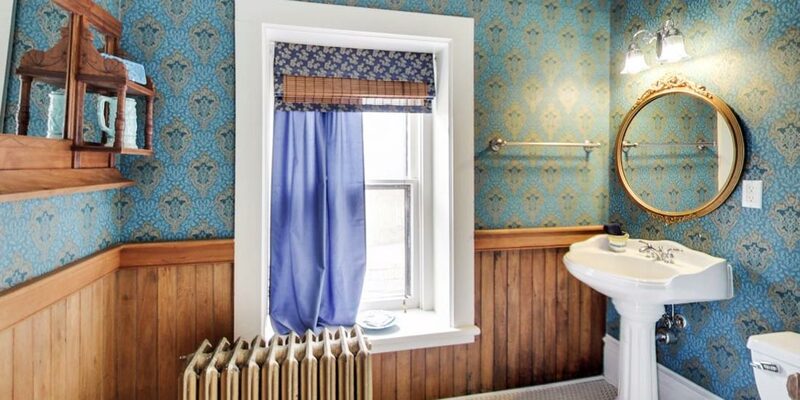 Enjoy views of Mississippi River bluff country. Converse with the one you love by the fireplace. 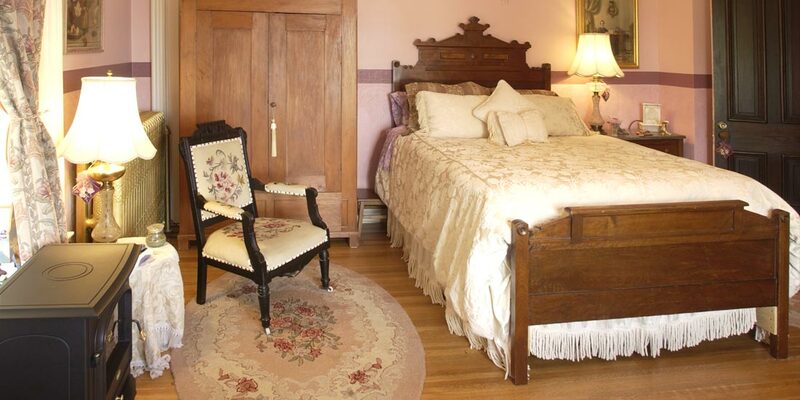 Decorated in dusty rose and pink, it is light and airy and has a classic Eastlake bedroom set with queen sized bed. 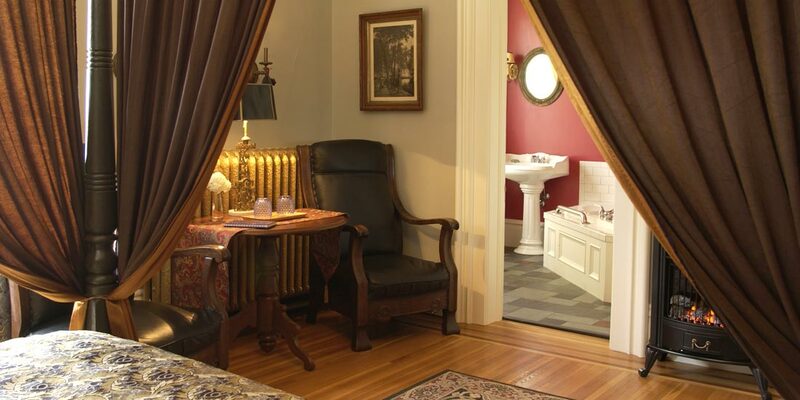 Put on your comfy Moondance Inn bathrobes and lounge on the giant 4-poster king sized bed. 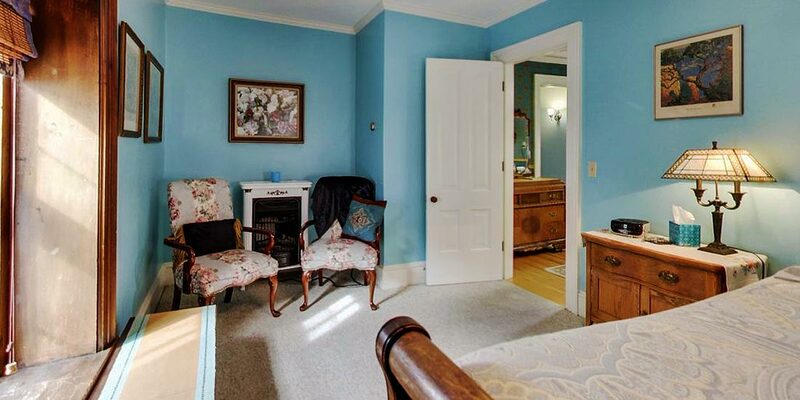 Or, sit in front of the fireplace in the oversized leather chairs and read a good book. 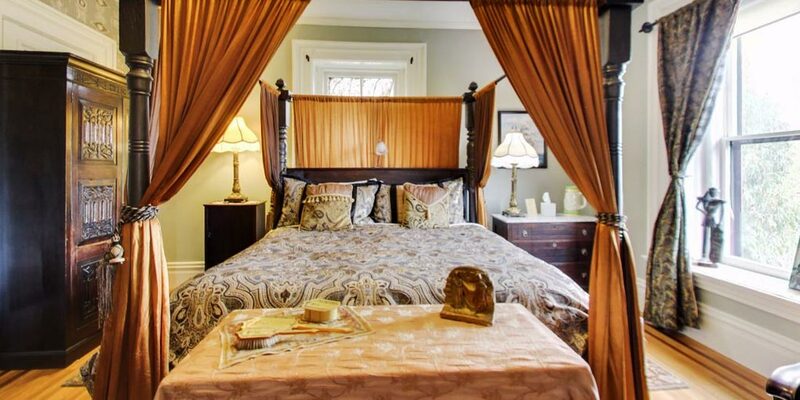 A beautiful damask duvet blends seamlessly with the gold and sage colors. Mississippi River bluffs provide a fine view from our Minnesota bed and breakfast. 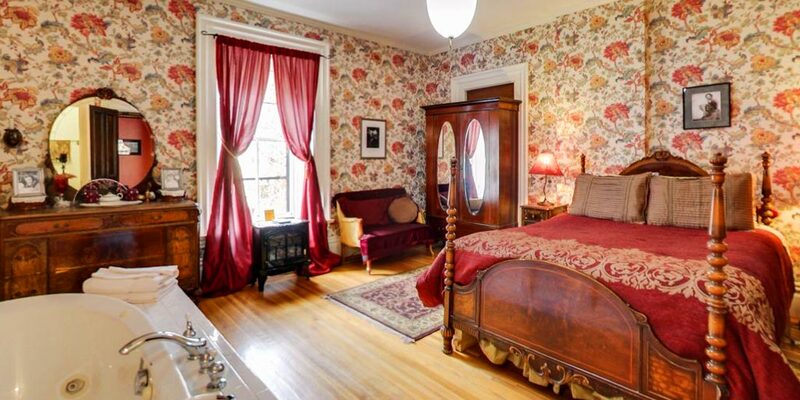 Lay on an exquisite queen sized Italian bed and watch the fire's flames dance. 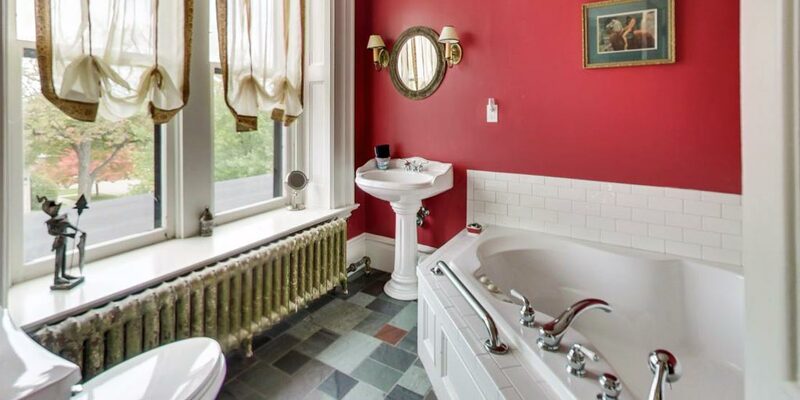 Recline in your whirlpool and take in the Art Nouveau style steeped in deep green and burgundy colors that create a sense of peace. Look out on the bluffs of the Minnesota countryside. 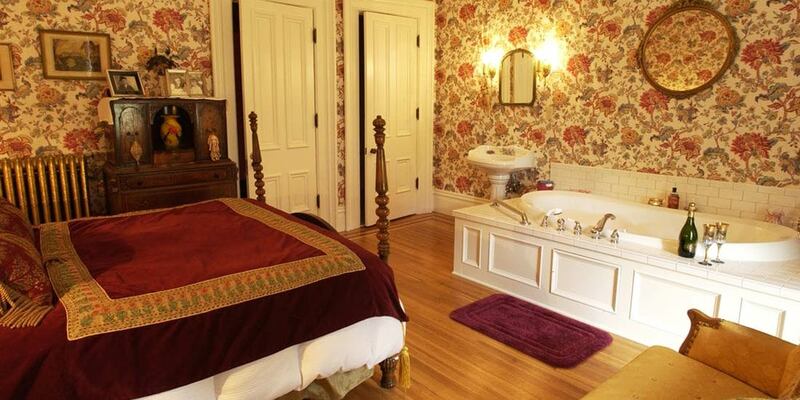 This is our most secluded guestroom. 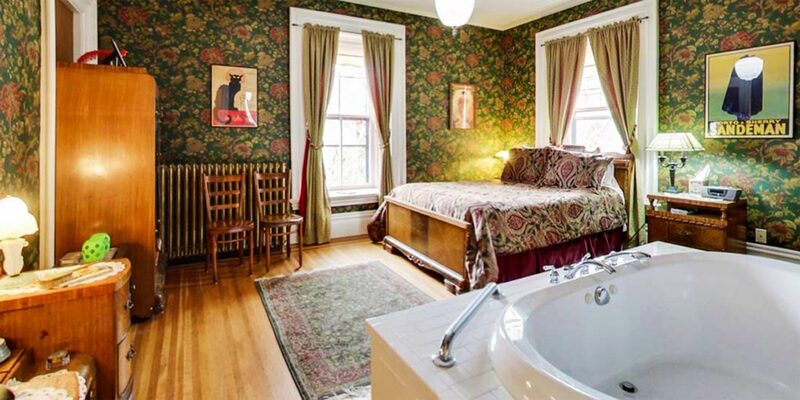 Meditate on the vibrant garden views and then relax in your private whirlpool room that features an original tin ceiling from 1874. 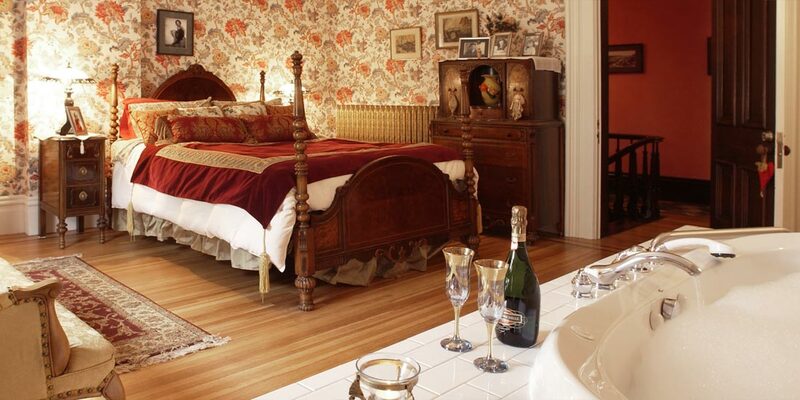 Stroll into your bedroom and sip a glass of wine. 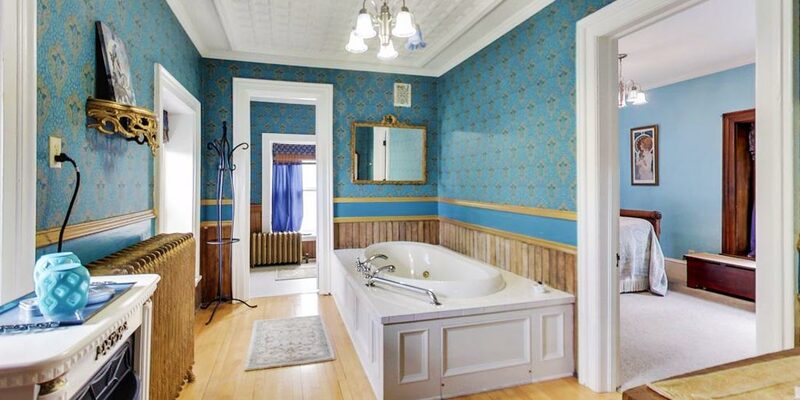 This suite is decorated in blue and gold with numerous art pieces on the walls. 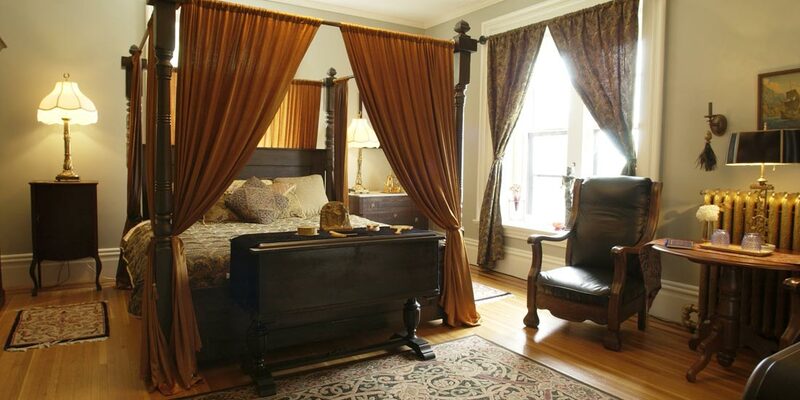 The antique furnishings include an oak queen sized bed. 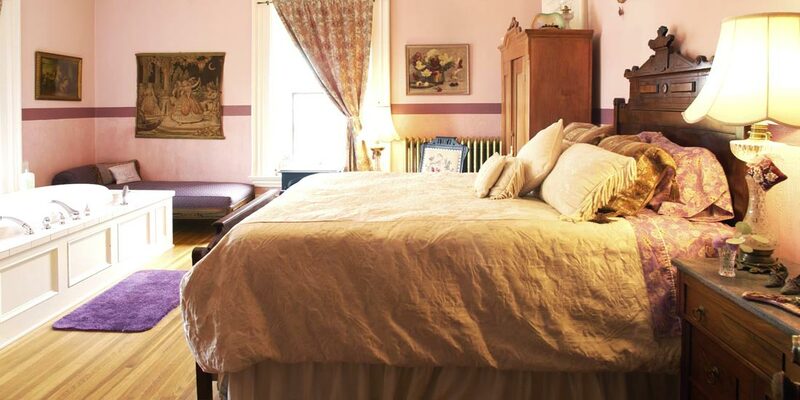 Luxuriate at our Minnesota bed and breakfast inn.